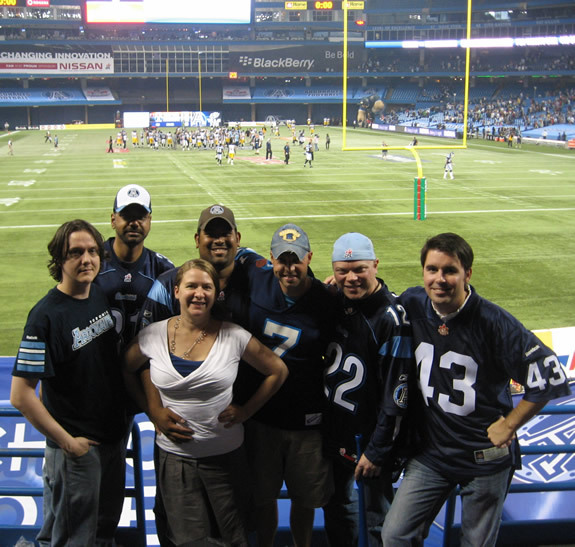 Welcome to the online presence of the first row (well, most of it) of Sections 122 and 123 Section 116 at Toronto Argonauts home games. We post… well, anything. Hell yeah, we post anything! I love the passion your group has for the Argonauts. Please let me know if I can be of any help during the season. We will see you at Varsity on June 20. Will the Jube of the Year be there for the last game? Hey, love the website. Good job reppin’ the double blue. Quick question. I just read the article about finding the Danny Brannagan jersey at the Argos locker room sale. Was that the 2013 locker room sale? I kept checking last year to see if there would be a sale, but I never saw any mention of it. Hate to think I missed it..
Any idea if it’s gonna come back for this year? Hope so. It should.